Dave Aldana and Gene Romero, who starred in the ground-breaking 1971 motorcycle sport film On Any Sunday, staked their claims as two of the most popular Stafford bike show star guests ever when thousands packed in to the huge Carole Nash Classic Motorcycle Mechanics Show on October 15/16 to meet them. Steve Plater tries (unsuccessfully!) to keep popular guest stars Dave Aldana and Gene Romero on track during their on-stage appearances at the Carole Nash Classic Motorcycle Mechanics Show at Stafford on October 16. 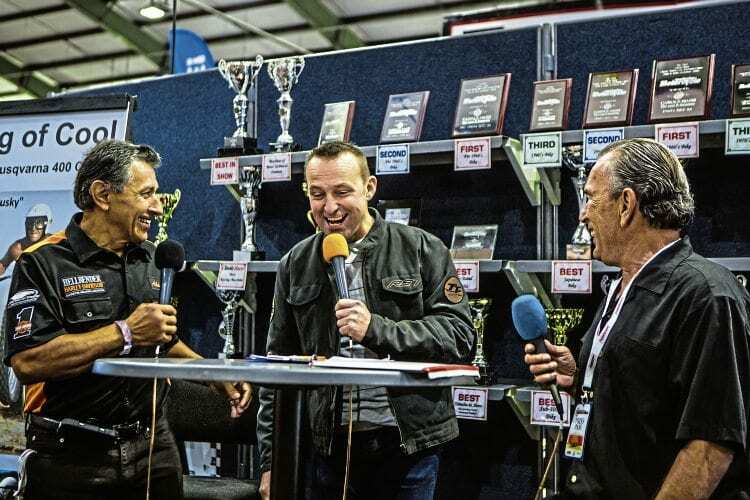 Compere Steve Plater certainly had his work cut out as he tried to keep the lively ‘comedy duo’ on track during their on-stage interviews as they covered a range of subjects including the film itself, their racing experiences and some truly entertaining stories from the glory years.